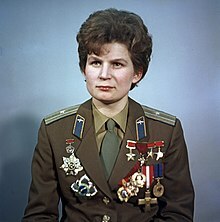 ↑ "Valentina Vladimirovna Tereshkova". Yaroslavl Region. 2016. ↑ Ghosh, Pallab (17 September 2015). "Valentina Tereshkova: USSR was 'worried' about women in space". BBC News. ↑ ereshkova, Valentina (4 January 1964). "Three days in outer space". The Saturday Evening Post. 237 (1): 62–63. ↑ Eidelman, Tamara (2013). "A Cosmic Wedding". Russian Life. 56 (6): 22–25.